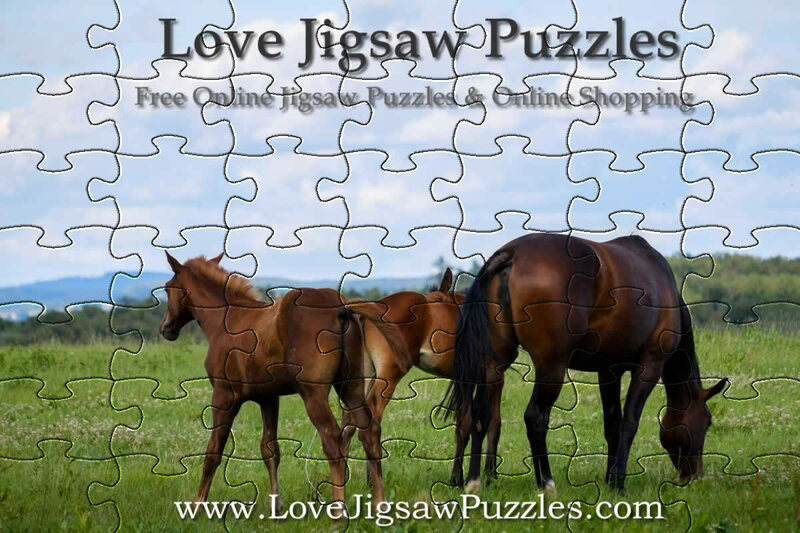 Play the Horses picture as a jigsaw puzzle or use your own picture to play the game. I hope you enjoy playing our jigsaw puzzle. The number of pieces can be changed from 10 to 100 jigsaw pieces - you then need to click on the Shuffle Button. Jigsaw piece rotation is switched OFF as a default. If you enjoy a harder challenge then click on the Rotation toggle button then click on Shuffle, you will then need to rotate the pieces to fit (using the right mouse button). Hint: The jigsaw is best played in Full Screen mode - Full screen mode can be used if you prefer no distractions, just click on the full-screen button at the top left of the game area. You can use your own picture to play as a jigsaw puzzle, just use the Create Puzzle button to find a picture on your computer. Shop Online with Amazon / Tienda en linea / Magasinez en ligne / Online einkaufen / Acquista online. Please use the links below to go to your countries Amazon store, thanks for shopping online on the Love Jigsaw Puzzles website. Thanks for visiting today, I hope you enjoy the free jigsaw puzzles, please tell your friends about our website, Love Jigsaw Puzzles. We look forward to seeing you again soon to play more online jigsaw puzzles. Hope you have fun using your own picture(s) to play as a jigsaw using our traditional Jigsaw and 3D Jigsaw Puzzle games. You can support this site by telling you friends about our website, and shopping online through this website with Amazon, thanks.